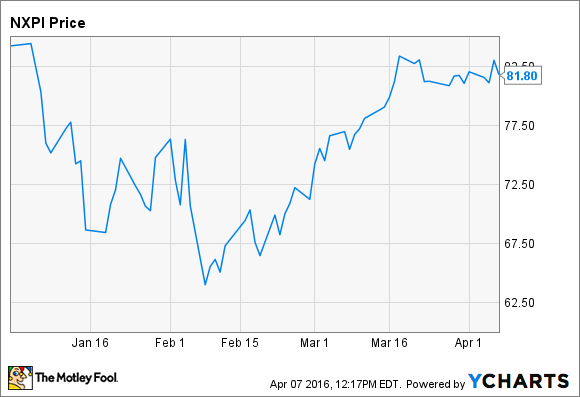 A strong earnings report in February began a rally that continued into March. What: Shares of semiconductor company NXP Semiconductors (NASDAQ:NXPI) rose 13.8% in March, according to data provided by S&P Global Market Intelligence. There was no new news in March driving this surge, but the company's fourth-quarter results, announced in early February, started the stock on a recovery that continued into March. So what: NXP had previously provided dismal guidance for the fourth quarter, calling for steep revenue declines in all of its segments. The closing of the company's acquisition of Freescale Semiconductor in December made it more difficult to make comparisons, as about one month of Freescale's results were included in the company's fourth-quarter numbers. NXP managed to beat analyst expectations for both revenue and earnings in the fourth quarter, although it's unclear whether these estimates included any impact from Freescale. Revenue came in at $1.61 billion, $300 million higher than the average analyst estimate, and non-GAAP EPS of $1.25 was $0.18 better than expectations. NXP expects first-quarter revenue of $2.17 billion and non-GAAP EPS of $1.10, numbers that are difficult to compare to the prior-year period because of Freescale's contribution. This guidance was apparently better than investors were expecting, though, as shares rallied on the news. Now what: Shares of NXP now sit around $82, down about 27% from the 52-week high. The company is facing a difficult demand environment, and its profitability is slumping. NXP expects a non-GAAP operating margin of 23% during the first quarter, down from 26.2% during the prior-year period. Freescale also managed lower margins than NXP prior to the merger, and that could further drag down profitability until the company achieves its planned synergies. ... we believe NXP is ideally positioned in the right markets, with the right customers and highly competitive portfolio of solutions. We believe the merger will result in significant value creation both in terms of giving us an even more competitive cost structure as well as broadening the product portfolio we can offer our customers.